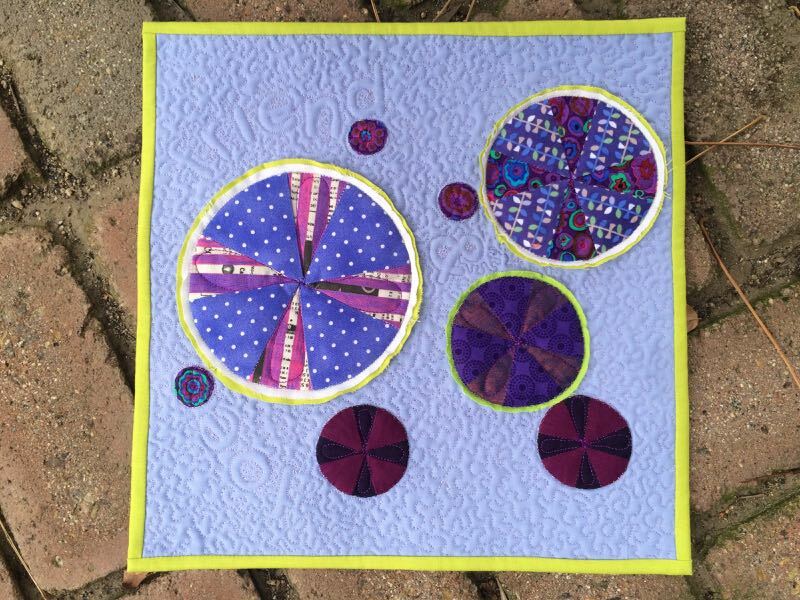 Friend and Foe: Four-in-Art Challenge • Feb 2016 | OccasionalPiece--Quilt! 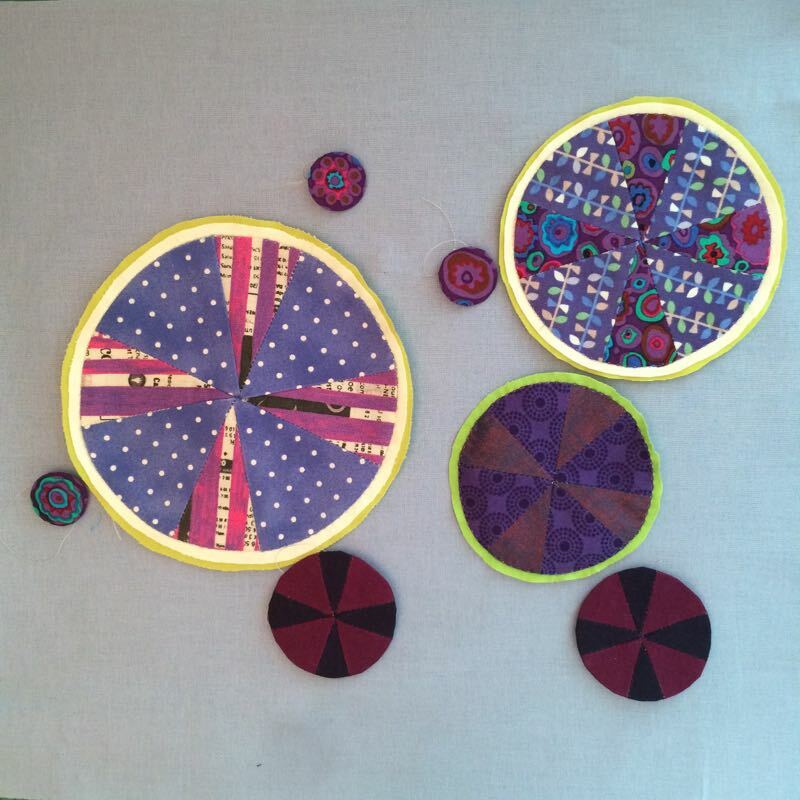 Posted on February 1, 2016 by Elizabeth E.
We have a new year and new members (see below) and a new theme: Color. And this quarter’s challenge was “microscope.” So of course, I started haunting microscopy sites, trying to find the right molecule to make for this challenge. And it had to be colorful, right? Of course, I can use any color I want — right? — so I decided to use periwinkle as the background, with magenta and purple as the parts of the molecule. Using a font like Simone used two challenges back, I printed it the words on freezer paper in my inkjet printer, then cut out each letter. 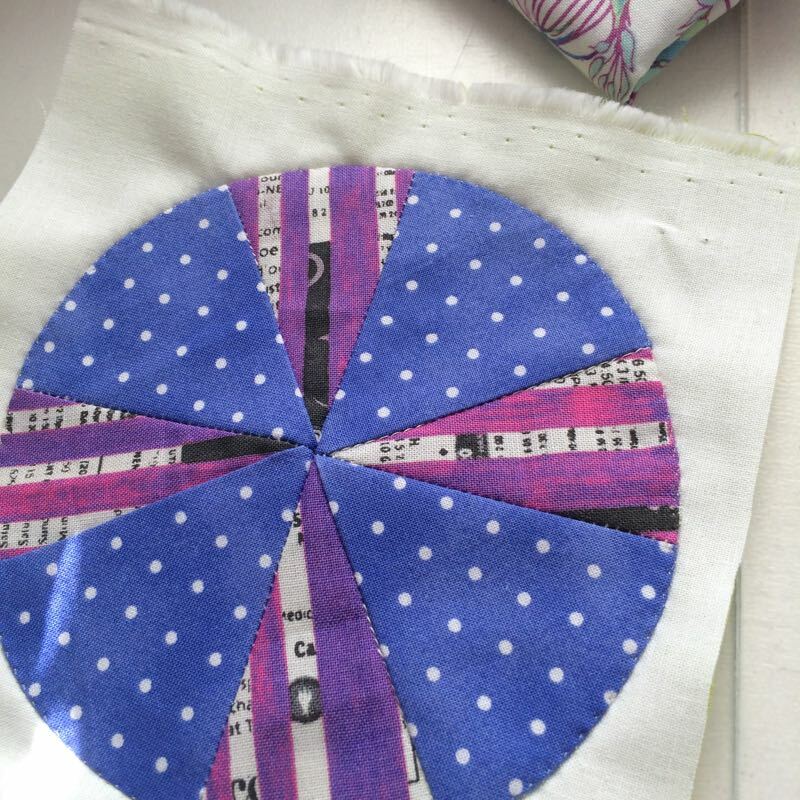 I didn’t cut out the centers, but just free-handed that when it was time to quilt around them. 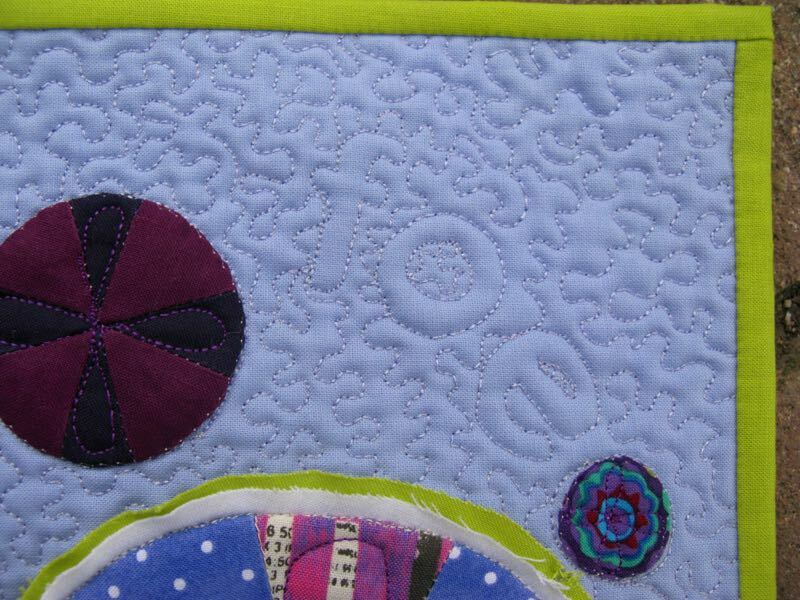 I first outlined the letters with small free-motion quilting stitches, then started stippling around them. I mean, I had just taken a class with David Taylor and if I didn’t know how to stipple now, I never would. I decided to leave the edges raw on the white and chartreuse fabrics to bring a little organic texture to the process. 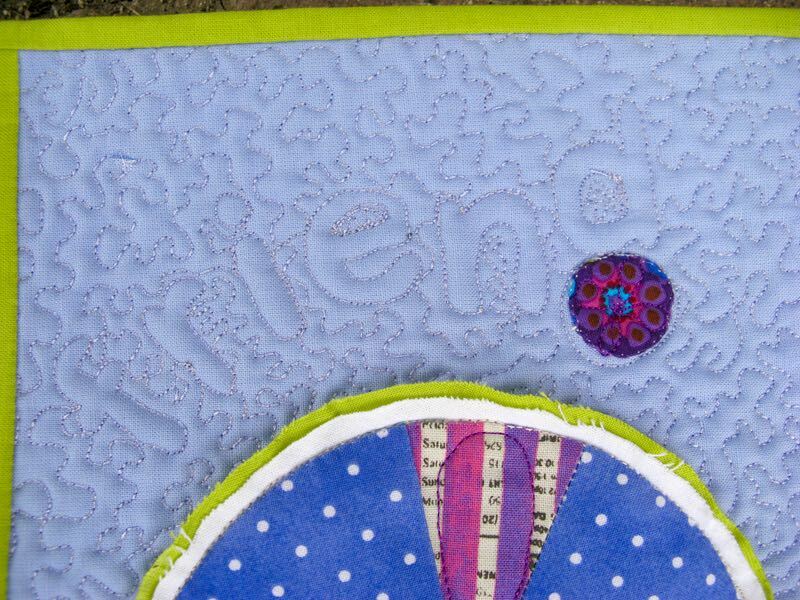 All the while, I’m thinking about the women I’ve known who have breast cancer, and while I stippled I sent them –and continue to send them– good karma for a long and happy life. 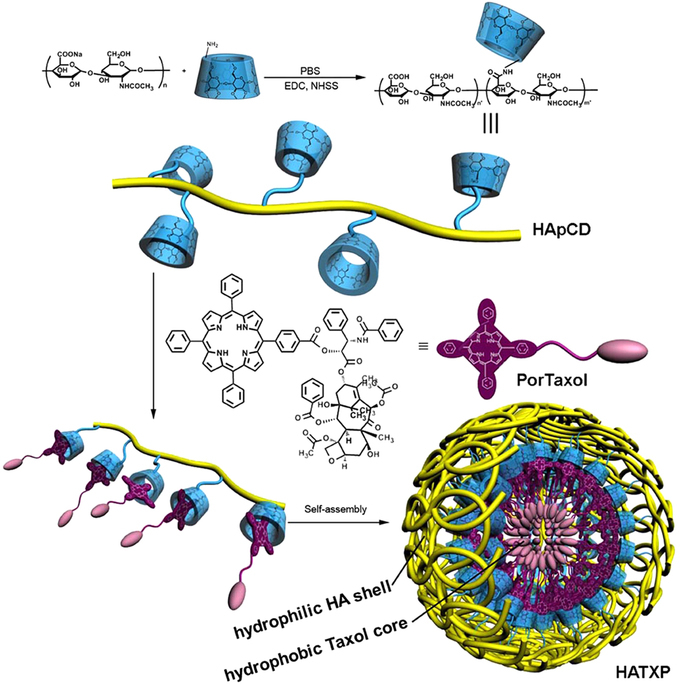 The birdcage fabric reminded me of that upper drawing of the sphere of Taxol, plus I liked it. 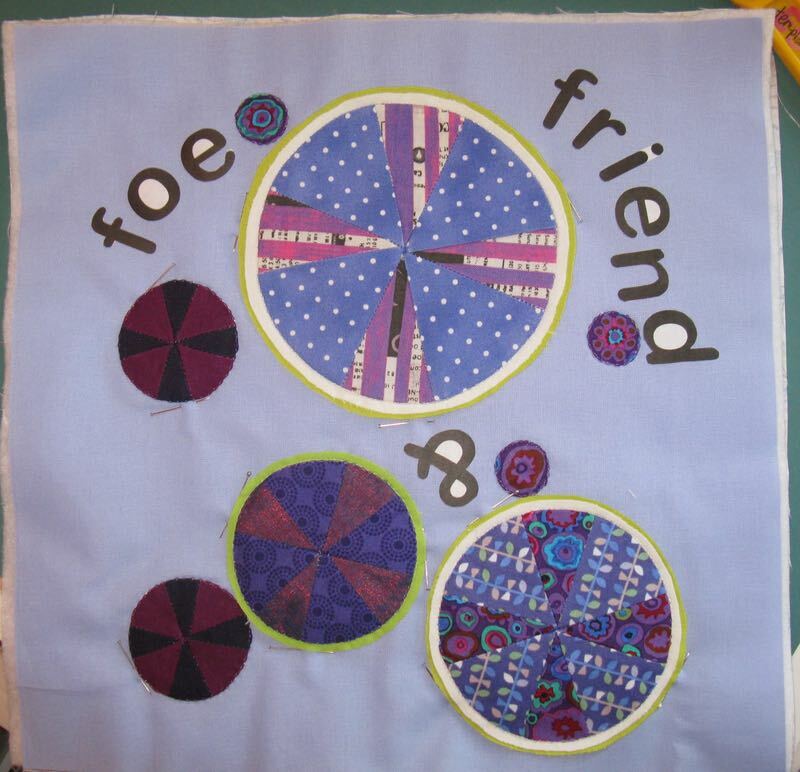 I had originally planned to have the quilt go this way: with the “friend” part first, but then I remembered what Heather said, and I realized that the Foe was first, then Friend. So I switched it around (correct orientation is at the top of the post). 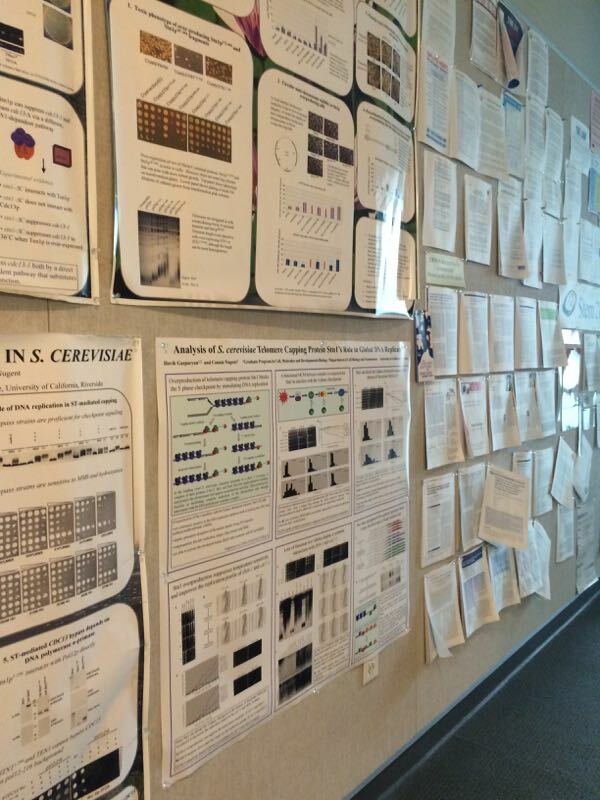 We went over to my husband’s work (he’s a professor at the local Big U) and I loved this picture of a real “science” hallway, with all the faculty’s posters of their results (shown at meetings) hanging along the hallway. This is his office, and why he never cares if my sewing room at home is a mess. Thank you, dear. 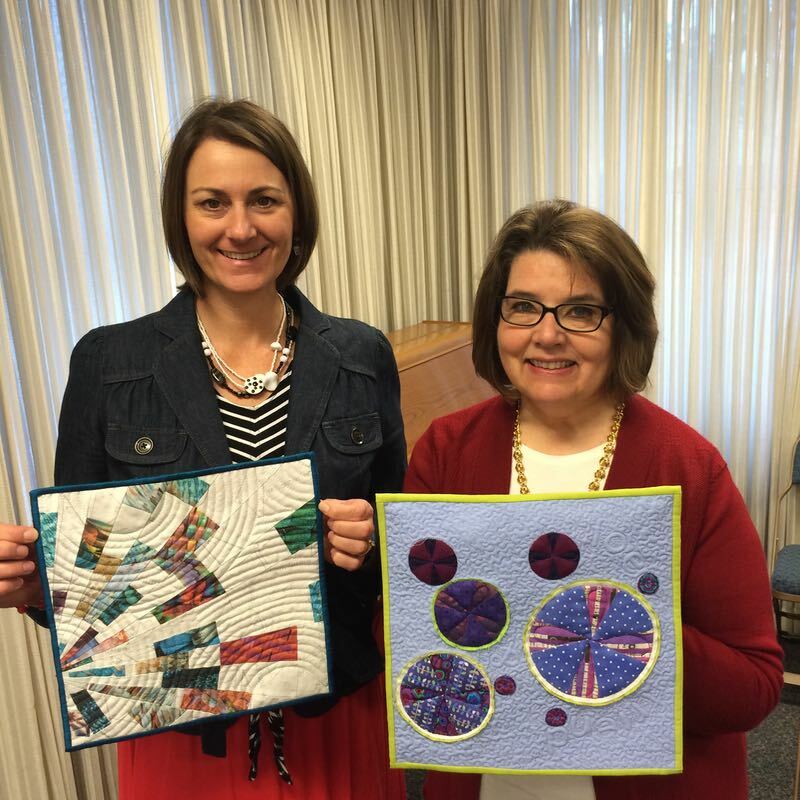 Simone and I at church, holding our Four-in-Art quilts. 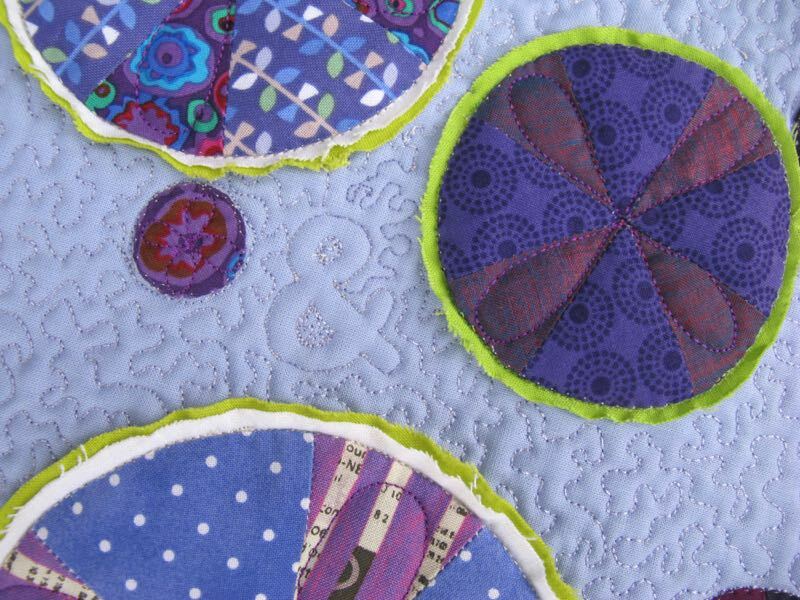 I am happy to have found such a fine group of quilters to make art quilts with. 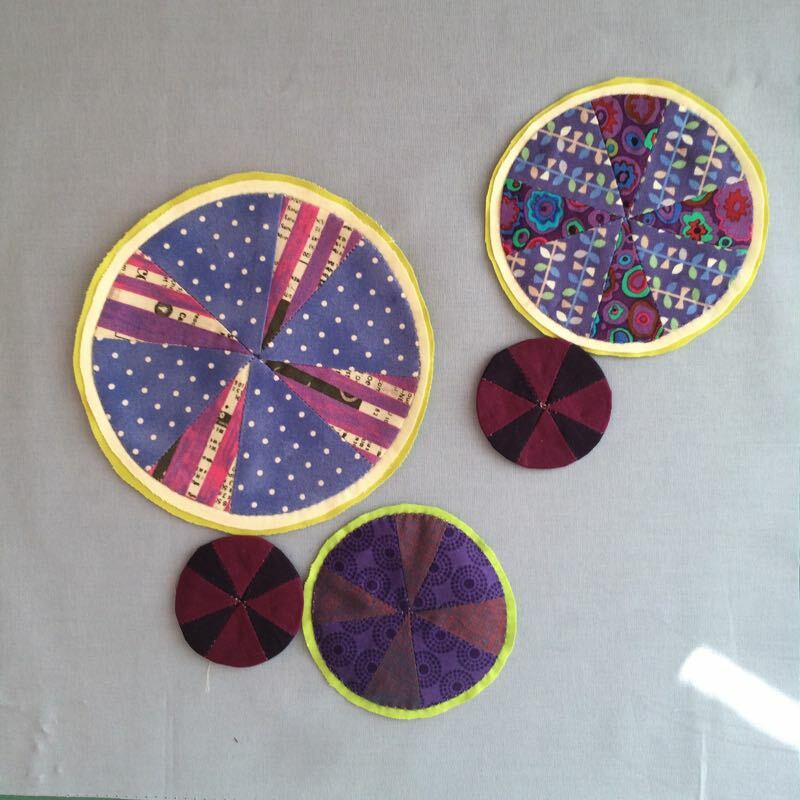 Bet you are wondering what Simone made, right? Please visit the rest of our group, to see how they interpreted Color: Microscope. 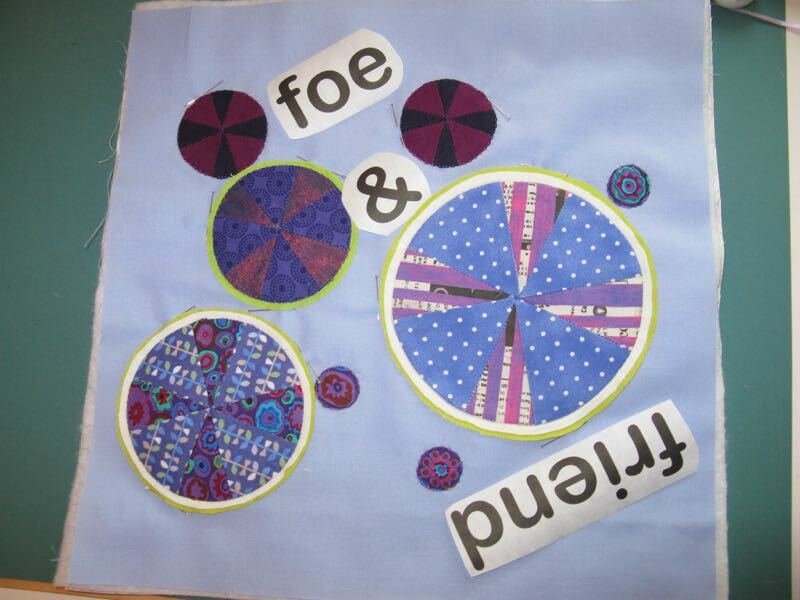 We also have a blog, Four-in-Art Quilts, where you can find us all. And Susan just announced next quarter’s challenge: Music. Reveal is on May 1st, 2016. Can’t wait to combine both music and color together. Occasionally my blog software places ads here so I can blog for free. It’s a good trade-off. I do not control the content, nor frequency, nor receive any money from these ads. Oh Elizabeth, I just love your interpretation – done for all the right reasons! 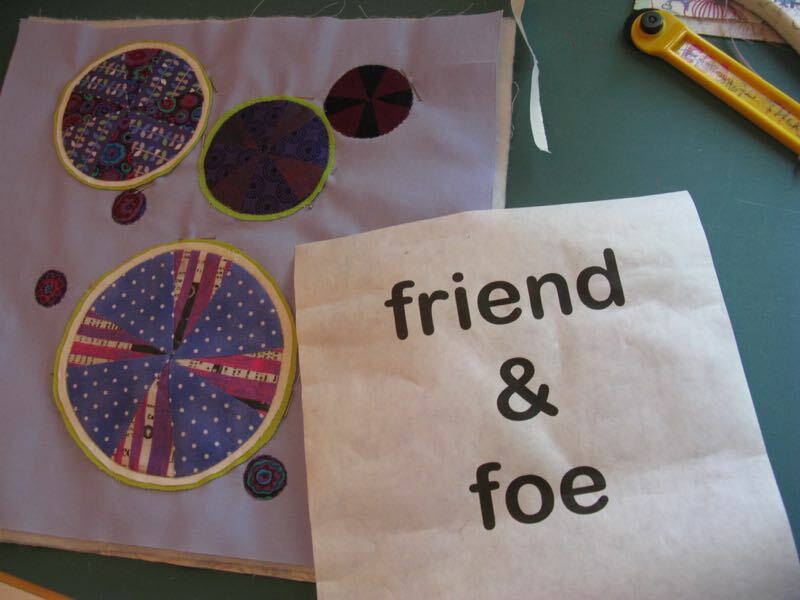 And quilting in “friend & foe” was genius and you did a wonderful job on it and the stippling. When I saw your peek last week, I had no idea which way you were going, but you nailed it! 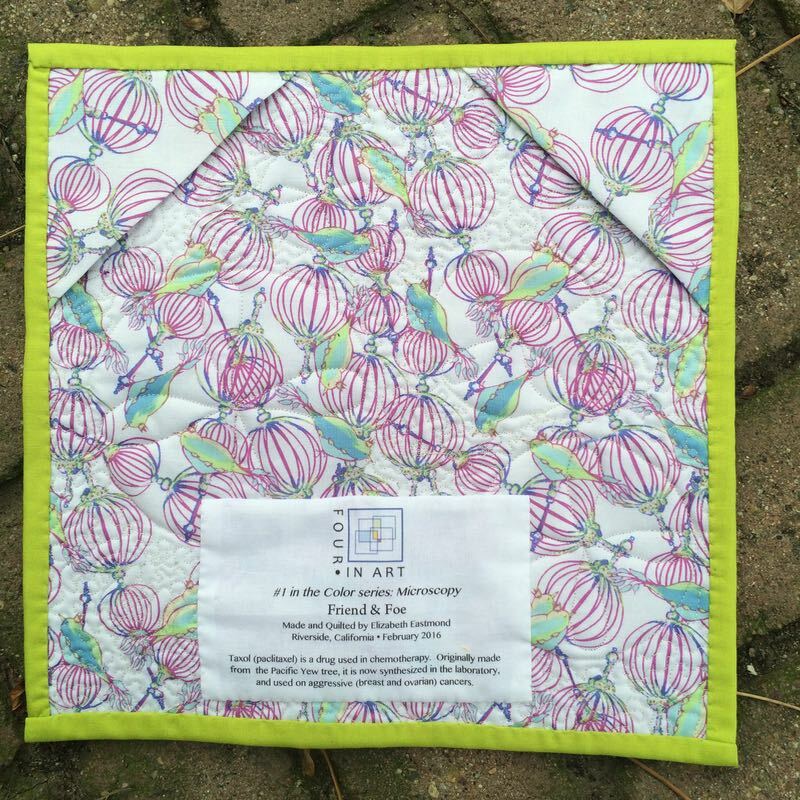 This is a great, thought-provoking quilt – a reminder that beauty can be found in surprising places! I really enjoyed the idea for this challenge and you captured it beautifully. I love the addition of the words too. Nice work ( as always)! Wow Elizabeth. I’m so sorry about your friends. Bless you for your thoughtfulness. Your quilt is amazing. Lovely! It’s amazing to me how beautiful things are in the microscope. The chartreuse was a brilliant move with the purple. 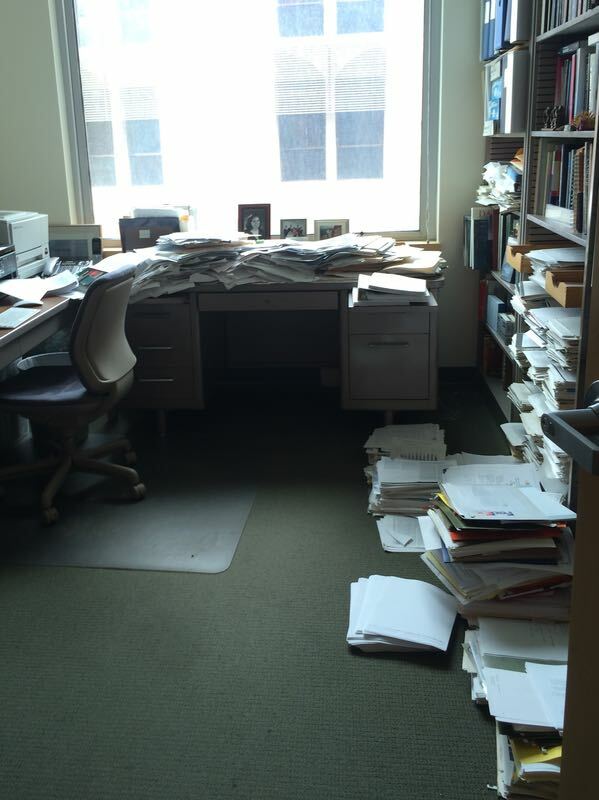 I loved seeing pictures of the university and office. Another intuitive interpretation of the theme Elizabeth! You add so many interesting layers to your mini! Love those words! Wow – that’s very impressive. 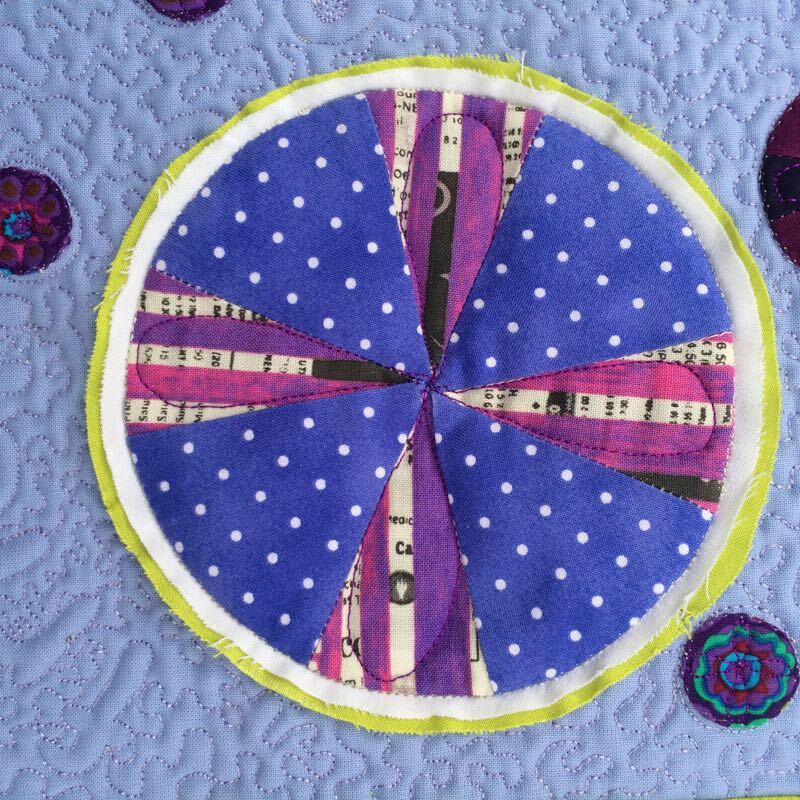 I love how you came up with the design, but also how you executed the quilt to such a high standard. It’s great you’ve found a group of ladies to do this with – working with friends must be so good, both for the motivation and the feedback. What a great representation of the complex associations that cancer and its treatment challenges us with. I love the photo with the microscope at the beginning and the later one of your husband’s office. Classics. Love how you all approach these challenges. I may have to play along with you on them and see how I can exercise my mind and my creativity. To my busiest of my busy bee quilting friends: Firstly, however do you churn out so many projects is beyond my wildest quilting dreams. 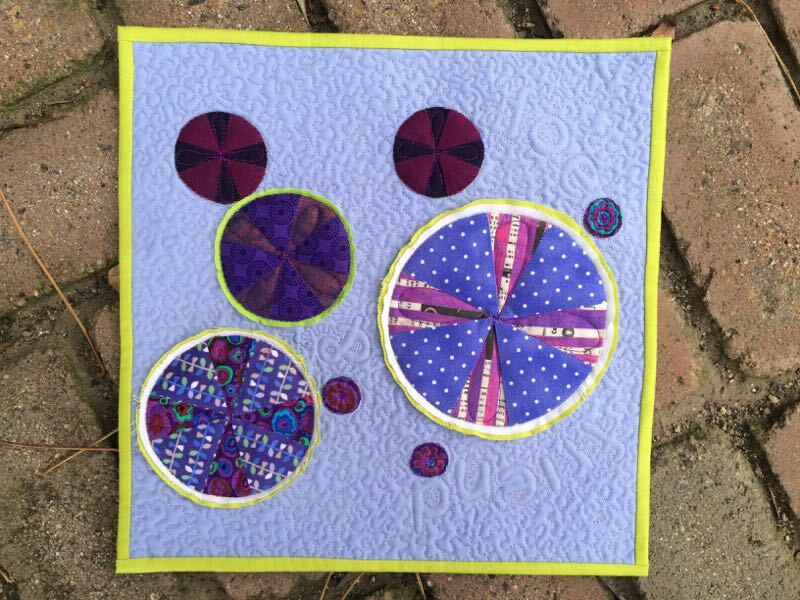 Secondly, I love your thought and planning behind your mini, the Taxol, your personal connection, colors, shapes, and quilting ‘friend or foe’ is such a wonderful addiction to your quilt. You are so thorough with your photos and research. 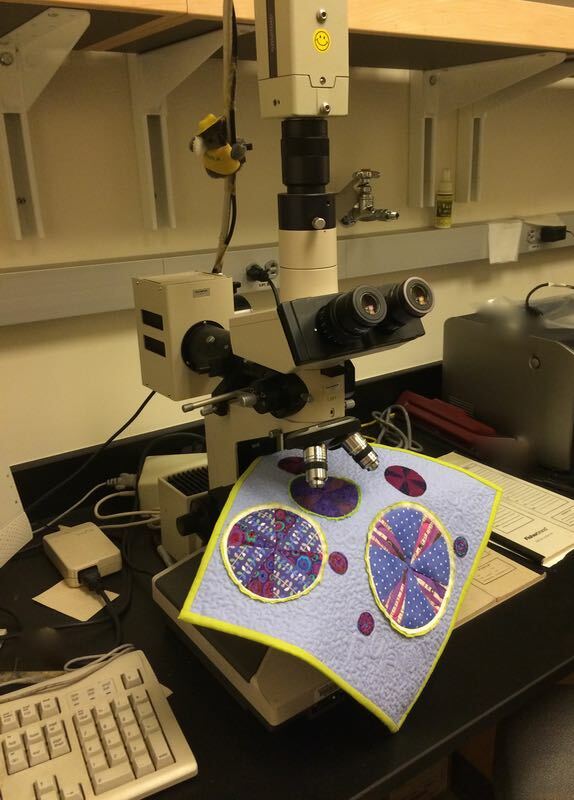 I love how you included a photo of your mini on a real microscope. Thanks for being a great example and for helping me explore the wide world of quilting. Sounds like you all have a good theme for the year. 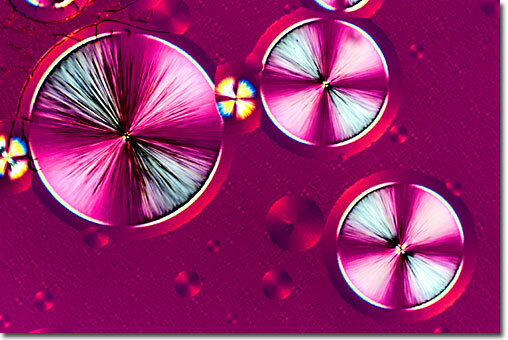 I find microscopic images so intriguing. Many are quite graphic and beautiful. The choice of raw edges was a nice touch and the words worked into the design brilliant. Off to see the others. 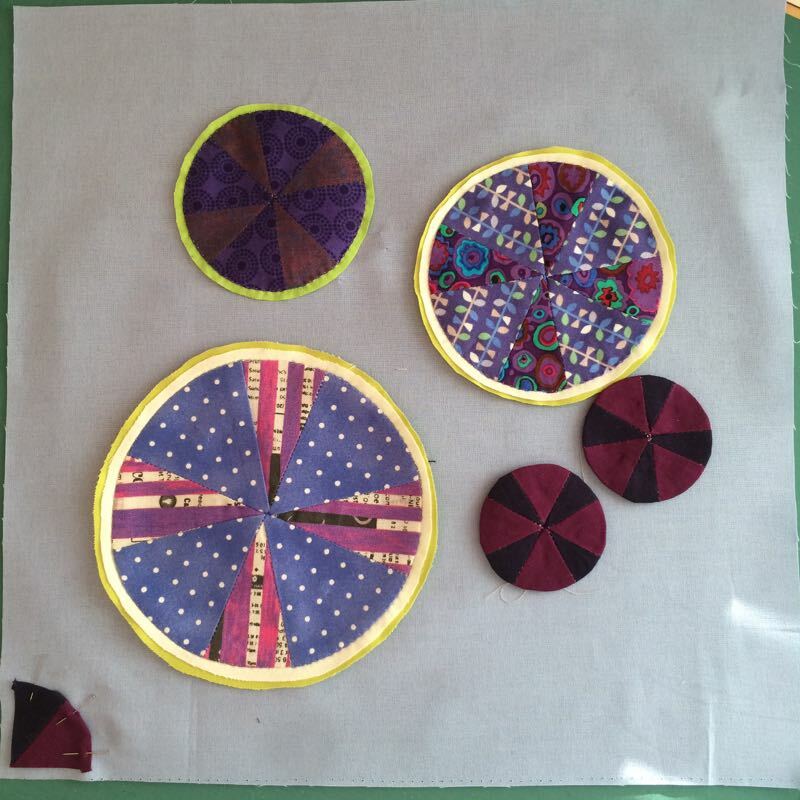 I love reading these posts and learning about the thoughts and processes behind the finished piece.